Improve your team performance. Spot bottlenecks at a glance. Forecast completion dates. In Cycle time scatterplot by Nave, each data point corresponds to an individual completed task in your Asana board. The color of a point corresponds to the label of your card in Asana. The height of the dot represents its cycle time - the higher the dot, the longer it took for that task to be completed. Pro tip: Watch out for extreme outliers! To avoid tasks being forgotten or left idle, consider implementing Kanban rules to swarm tasks if they pass certain percentile lines. Cycle time scatterplot by Nave is using the cycle times of all tasks completed within a specific time frame to give you probabilistic task completion forecasts. The percentile lines determine the estimated completion time of a single task and the probability of that commitment being met. The logic is simple - a higher percentile means there's a greater chance of completing the assignment. Pro tip: Involve your customers and stakeholders and ask them what kind of confidence level they would be most comfortable with. We recommend starting out using the 85th percentile to define your service level agreements. By using CTS data table you can observe how the average cycle times and their probabilities for the different process states change over time. Ideally the values should go down or stay similar. This means that your team is efficient and they deliver value at a stable pace. Pro tip: If the values go up, the first thing to look at is your work in progress. Apply limits over it and make sure everyone respects them! 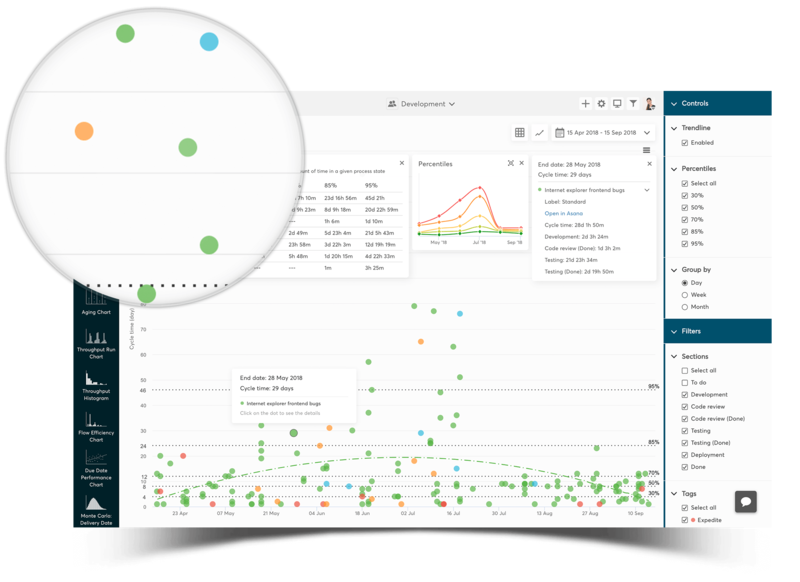 Cycle time scatterplot by Nave enables you to quickly identify and analyse single work items that strike out on their own. These are often forgotten or neglected tasks in the process. Tasks that have much longer cycle times than the rest are good candidates for a closer examination to identify impediments. Pro tip: Look for patterns in your data! Gaps, high variability, clusters of dots or a progressively growing triangle shape are warning signs that either your Kanban process or your team have encountered bottlenecks that need to be taken care of.